A few weeks ago, I did a blog post on Evo hair products. I'd been using the Therapist shampoo and conditioner that I got from a Lust Have It! box and I absolutely loved it. 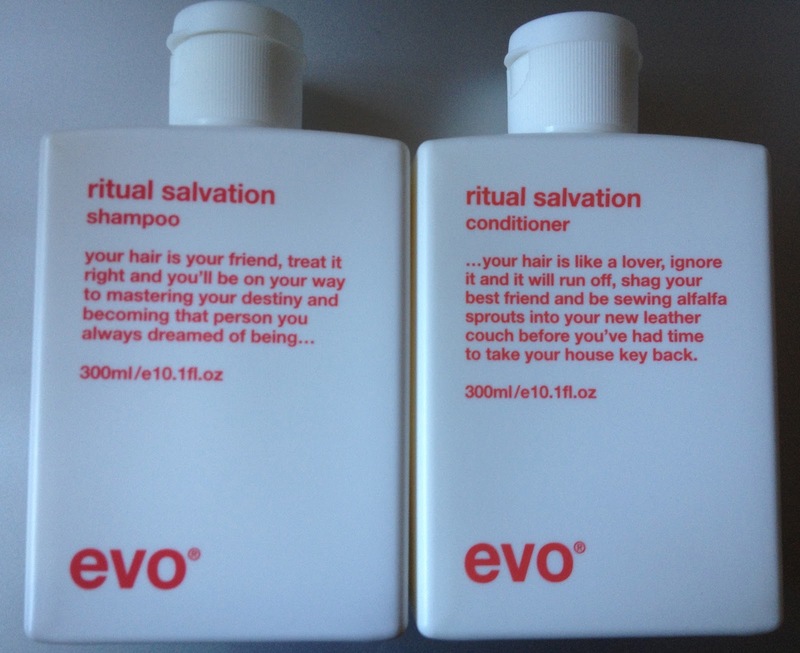 When I finished the samples, I tracked down a hair dresser in Surry Hills (who stocked Evo) to buy some more but she convinced me to buy the 'Ritual Salvation' shampoo and conditioner instead. She also told me that I needed a hair cut even though I'd just gotten one 4 weeks earlier at the best hair dresser I've ever been to..... (I probably should've known better than to listen to her. If you were interested, my hairdresser is Fringe on Crown in Surry Hills). I've been using it for about 2-3 weeks now and I have a love hate relationship with it. It doesn't do anything for my hair and it doesn't make my hair feel clean. I forgot to take it into the shower the other day so I used some Herbal Essences shampoo (the blue one) instead and I felt that it was 10 times better than this. It's also about 5 times cheaper haha. However, last night, I used the Herbal Essences shampoo and Evo Ritual Salvation conditioner and afterwards, my hair was really soft and tangle free. I'll keep using it but I can't justify the cost of it since I don't love it. I might completely swap to Herbal Essences once I'm done with this. I use Herba Essences Long Term relationship. I'm not the type to go for high end stuff anyway but this is by far the best conditioner I've used. After using it long term it makes so much of a difference. I'm going to try out all of the Herbal Essences range next time as the Evo wasn't worth the money. Aww no :( I hate it when that happens! You spend a lot of money investing in a better product, and then your el cheapo one was better all along! I know right! I'm so annoyed that I spent $50 for the evo but my herbal essences is about $10.